Happy “How To” Day! We’re learning how to peel ginger the easy way and discussing when you should peel ginger root. You don’t always have to! To peel or not to peel, that is the question. 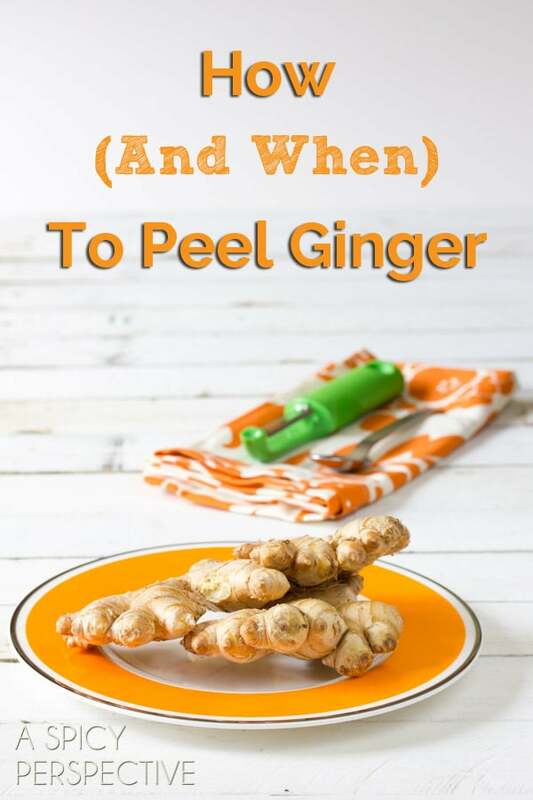 Actually, the decision to peel or not to peel your ginger root, isn’t that difficult. Look and the skin quality. If the peel is dry and wrinkled, PEEL. This thick dry skin will add a tough papery texture to your dish and touch of bitterness. 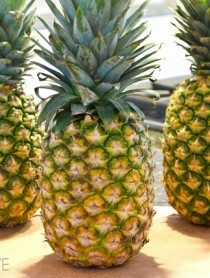 If the ginger skin is smooth and looks new, don’t worry about peeling. Thin smooth skin won’t effect flavor or texture. 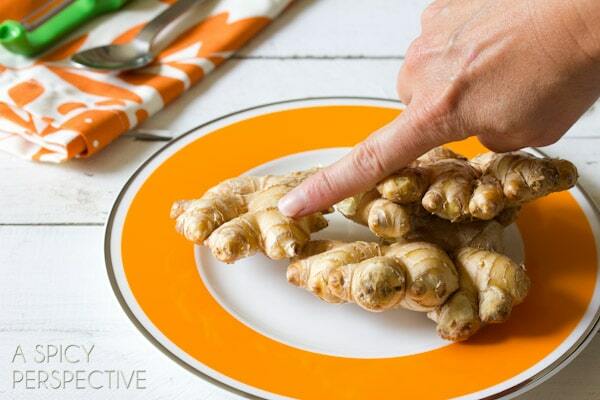 The dry skin means your piece of ginger root is older, while smooth skin is the sign of newly harvested ginger. The older piece of ginger may have just as much flavor on the inside, you just don’t want the skin to effect your dish negatively. There are two common methods, one better than the other. 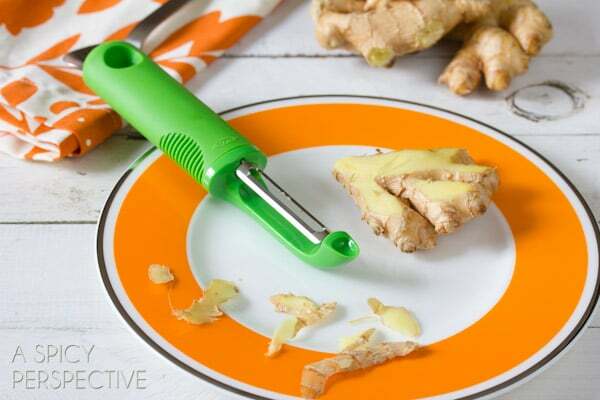 Most people start out peeling ginger with a veggie peeler. 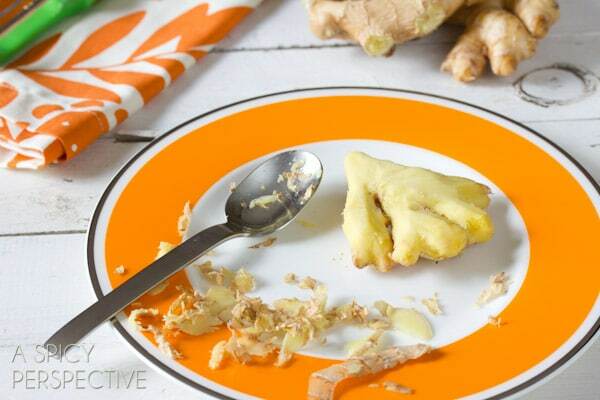 Although veggie peelers are good for all sorts of things, peeling ginger root is not necessarily one of them. The knobs on ginger roots are usually so close together that the skin in between them is hard to get to with a traditional peeler. See? It only removes the surface skin. 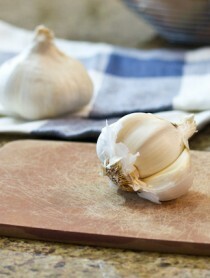 But if you use a spoon, the rounded edge of the spoon can fit down into the nooks and crannies of the ginger root. Just scrape the spoon along the ginger on all sides. The spoon works down into the grooves and takes ALL the skin off! Colorful Anmut Dishes from Villeroy & Boch. 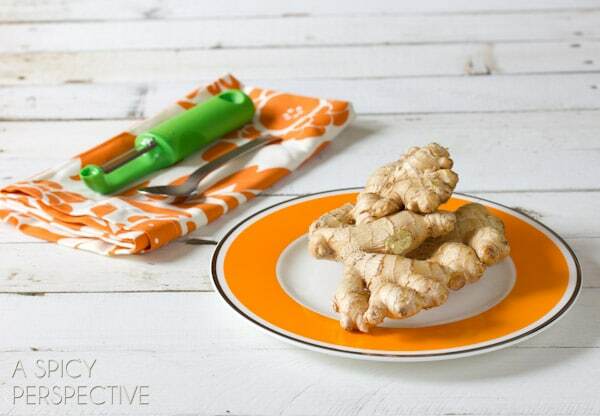 Now you can slice or grate your ginger and cook away. If you freeze it can you still use it like fresh? I freeze it all the time. I wish I knew about the spoon method earlier–it works SO much better than a knife or peeler! I just love your tutorials, Sommer! wow you wrote everything that my mother taught me. Peeling a ginger used to be a scary thought, but it’s kinda fun! I even engage my kid in it :) Lovely photos to demonstrate ! This is great, I will be using a spoon from now on! Love these tips! Thanks so much for sharing, Sommer! I was literally just wrestling with a knobby hunk of ginger last night! This post will be a go-to for me :) Thanks, lady! I love fresh ginger and I love your tutorial posts. So helpful! Great tip! I love ginger! I never think to leave the peel on but you’re right the young pieces really don’t need to be peeled. Great instructional post. 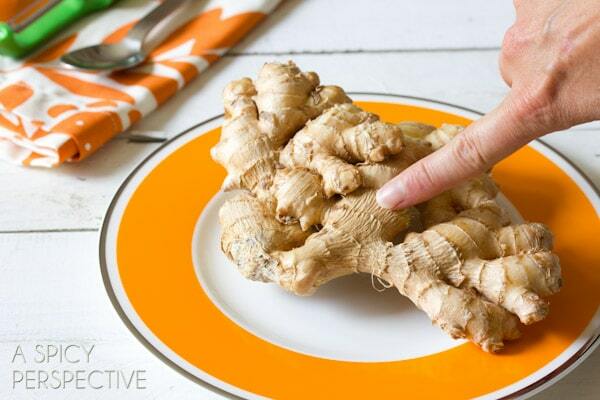 Ginger is one of my favorite flavors to add to soups and asian style meals. Methinks it is the best! Nice tutorial! I generally just use the dull side of a knife to ‘peel’ ginger. 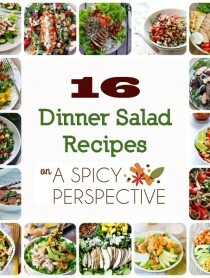 Great tips, I’ll be trying the spoon method next time! Love your informative posts, Sommer! I totally needed to read these tips ~ thanks girl! I only knew the spoon trick. everything else was new. Thanks for the great tid bits!! Thanks for the tips! I love fresh ginger, and usually peel a root when I buy it, then pop it in a jar with vinegar and a bit of sugar — it’ll keep forever in the fridge. Great tips, especially on the skin. peeling ginger is definitely not one of my favorite things to do. I feel like I end up peeling off way more than the skin! Oh I love peeling with a spoon!! 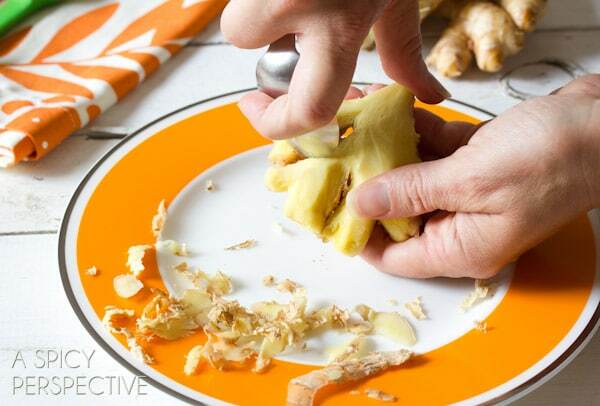 It’s one of the greatest ways to peel ginger – thanks for showing this again, it reminded me to check skins before peeling!! Great advice!!! Use ginger all the time…sooo good!!! I just added a huge nub of ginger to my smoothie!!! You know what’s crazy though? I stopped peeling it last year after an Indian chef told me she never peels it. Lazy much? LOL yes!! Regardless – love this post!! Great post Sommer – so interesting but I don’t think my parents ever peeled ginger before using it, although they probably cut off any dry skin. Good to know! Didn’t know you could leave the skins on…I have never been able to emulate those around me and get the skin off with just a knife!